SKINCARE REVIEW. THREE OILS. | Life Looks Perfect. 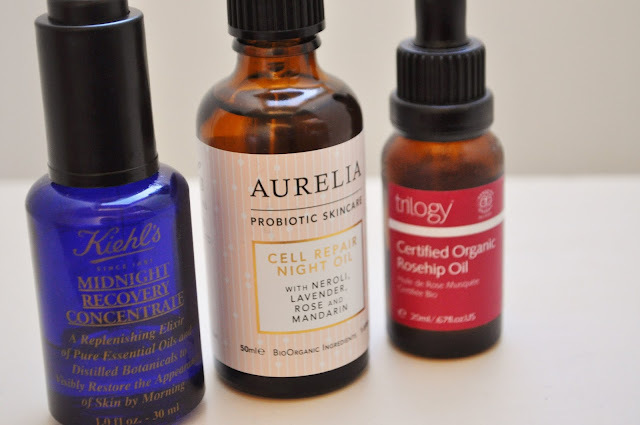 A new oil to my collection, thanks to British Beauty Blogger for including it in her first Beauty Box back in the summer. Now I could go on about that beauty box for hours but just to have even got the chance to try this oil has made such a difference to my skin. 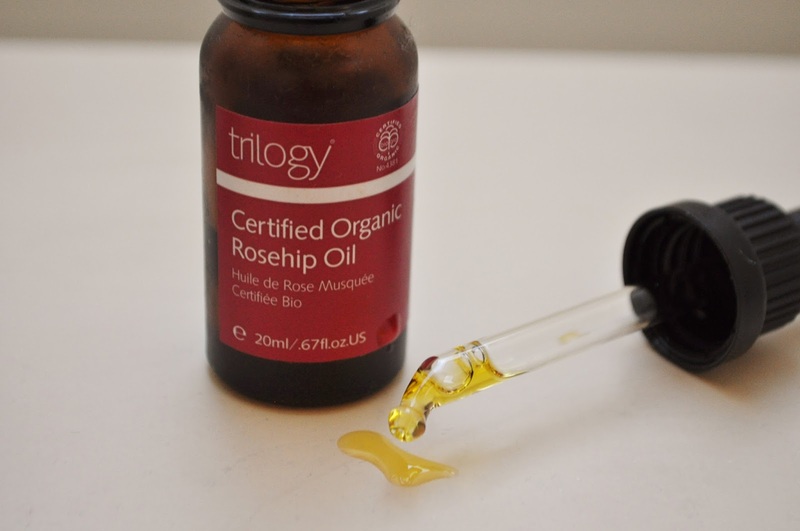 Trilogy's Rosehip oil is meant to help scars, wrinkles and uneven skin tone due a powerful blend of vitamins and oils that assists in repairing the skin. With only certified organic Rosehip oil in this little glass bottle of goodness, you won't be finding any preservatives or nasties that would irritate the skin. As the months are getting colder now in UK, this oil is great for re-hydrating the skin, which is a must have with all the central heating and harsh chilly winds. The main reason why I particularly fell in love is the dramatic improvement of some horrible spot scars that I have had on my chin area for months. I would go as far as saying, this oil has been the only product that has started to shift them. I have been using this oil mainly at night after all of my usual skincare habits, where I can then really enjoy massaging it into my skin. I am not too fond of the scent of the oil but it feels like a dream on the skin. 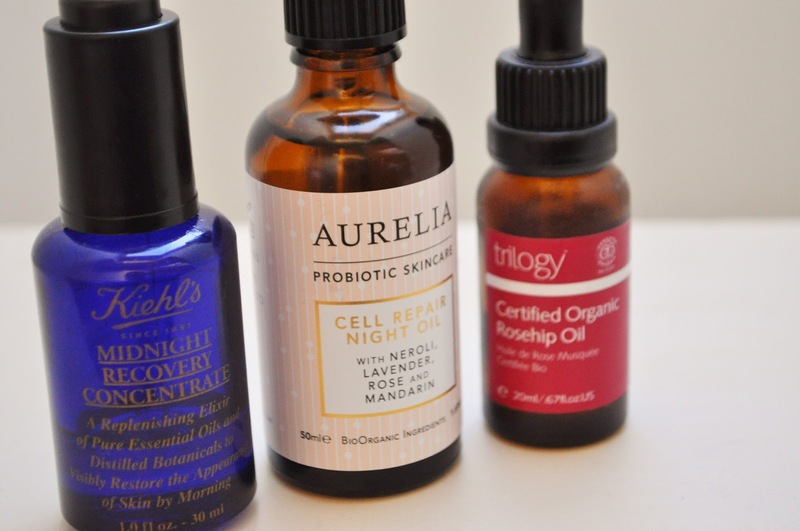 Since using this oil, Jess has actually commented quite a few times how even my skin has become, which has been news to my ears! I have forever been very self conscience the redness around my nose and the scarring from evil under the skin spots but finally now I feel they are shifting and my skin is looking radiant. 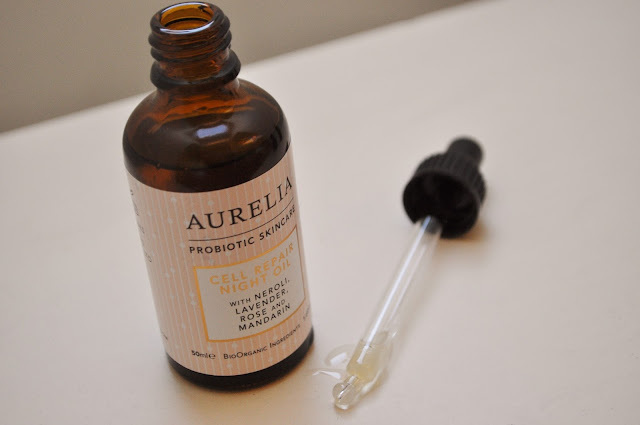 A new beauty brand to add to my addiction ladies and if you haven't tried Aurelia's probiotic skincare you need to get it on your Christmas list asap! This intensive overnight treatment oil is my favourite at the moment not only as it is beautiful on the skin but also it's scent. I am a huge fragrance buff, well it's basically is part of my job but honestly when I find a fragrance I love, I become addicted. So hello Aurelia...my new addiction. This oil is a fantastic overnight treatment that helps to hydrate, smooth and soothe the skin, so when you wake up in the morning your skin will be glowing. The oil is filled with rich fatty acids, oils and vitamin E that help keep the skin healthy and plump. With no nasties like synthetic fragrances, mineral oil or silicone's, this oil is perfect for all skin types. Now to the scent. It is a beautiful and delicate blend of mandarin, neroli, rose and, my favourite, Lavender. The fragrance is extremely calming and trust me when you massage this oil into your face it is divine. I tend to use this treatment two to three times a week before bed time. I would certainly recommend this oil as the perfect gift for any skincare addict or if you are looking to invest some TLC into your routine. One final word, Aurelia Skincare is Made in England, which for me, is something I always like to keep an eye out for, as personally I want to support brands home grown from the UK as from experience, I know how hard it can be. Well Aurelia, you have captured my attention and I hope to see more of you in my beauty cupboards. 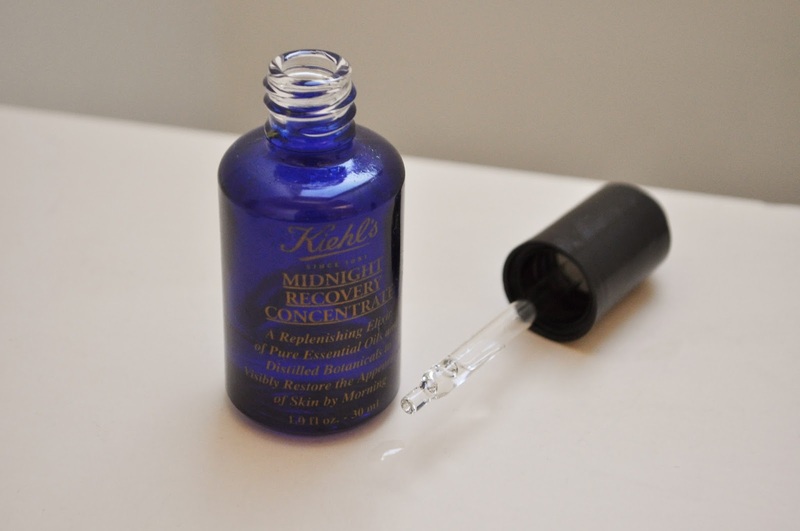 I have written about this oil quite a few times now and I must say every time I catch myself writing about Kiehl's Midnight Recovery Concentrate I fall more in love with it. Despite my sceptical thoughts back at the beginning of the year, I have started to use this concentrate for more specific skincare needs. For me, it has been battling spots. 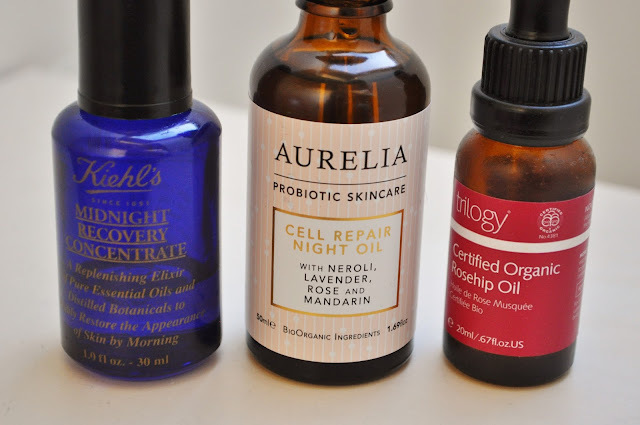 When I feel that my skin starts to go down that evil road, I have been using this concentrate at night after my usually skincare routine to help heal and fight a bad skin spell. Now, we all know spots don't just disappear over night, well mine certainly don't but this concentrate, helps to calm them down and take out some of the redness, without drying my skin out. Once again, I can't help but comment on the fragrance of this oil. As you may already know, Lavender is my thing and this oil....oh boy...oozes the heavenly scent. Gently patting this oil directly into the skin, is a ritual in itself and drifts me straight off to sleep. Now I don't want to become too much of an enabler but if there was one beauty gift that Santa should be bringing you this Christmas, it should be one of these fabulous three. Do you have your own holy grail oil? I just sampled the MRC a couple of weeks ago and bought the full sized bottle yesterday. Can't wait to post about it. Love to read others thoughts on it. Great post!